1732 The Town Council expresses concern about a threat to “guff”. 1800 Earliest noted golfer on the links is Captain John Chiene of Williamstone Farm near North Berwick. 1832 The first meeting of The North Berwick Golf Club is held on 1st June 1832. 28 Members played the 6 hole course. It was agreed that the maximum number of Members will be 50, with a subscription of £1-0-0. The first Captain of the Club was Sir David Baird, Baronet. 1838 Membership now up to 55, with annual subscriptions of £2-0-0. 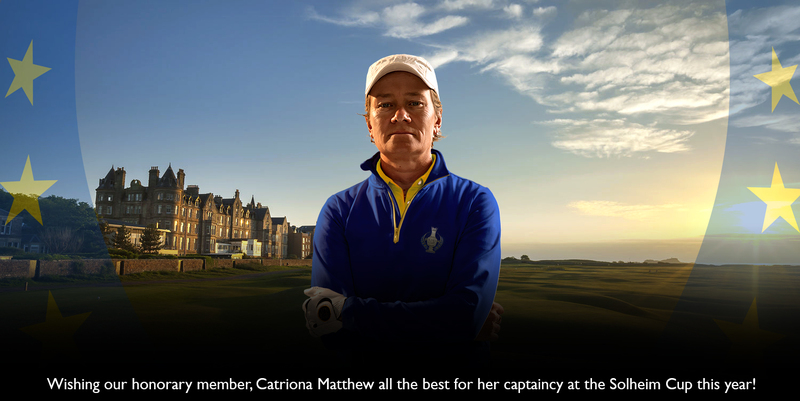 20 Members of the Club are also Members of The Royal & Ancient Golf Club of St Andrews. 1848 First mention of purchasing a Clubhouse is noted. Until now a marquee was pitched for each of the Club’s main meetings. The Club’s finances show a debt of £86-5-0 to the estate of the late Secretary, Mr Wauchope. Life Membership is offered for £10-0-0. 1849 Old Tom Morris (St Andrews) and Allan Robertson take on Willie and Tom Dunn (Musselburgh) over the 7 hole course with a side bet of £100-0-0. This is the start of several challenge matches hosted by the Club until 1900. Plans to purchase the Tollhouse discussed. This was located on the site of the current Clubhouse). 1853 Tantallon Golf Club formed. 1854 Minutes show a total of 64 Members and debts of £61-0-0! The ideal of purchasing a Clubhouse is discussed again. At this time, there was no Greenkeeper to tend the course. 1860 Minutes show concerns raised”….of long waits in the summer at hole after hole and a round could take up to 3 hours…” And this for a 7 hole course! 1862 The quarry on the 2nd Hole (Sea) was filled in. 1863 The Club decides to hold just one meeting in September so as to fit in with the Doncaster Races! 1868 Lord Elcho donates a medal for competition amongst children – the oldest Junior Competition Prize in the world and still played for to this day. It is on display in the New Clubhouse. 1869 Tom Dunn is employed a Greenkeeper. 1873 Bass Rock Golf Club formed. 1876 David Strath becomes Head Greenkeeper. 1877 Agreement reached with The Archerfield Estate to encroach onto Ferrygate Farm to Eil Burn. Cost of extending the course was £300-0-0. The first tee is moved from the eastern end of the current Council Putting Green to its present location. 1879 Membership now at 60.The ideal of purchasing a Clubhouse is raised yet again. David Strath, Head Greenkeeper, dies. In September, The New North Berwick Golf Club is formed to build the New Clubhouse. The site of the Tollhouse was purchased by Sir Hew Dalrymple and feued to The New North Berwick Golf Club. The cost of the building was £1400-0-0, raised with a loan for £1500-0-0 from the British Linen Bank. 100 lockers were installed, which are in the Clubroom to this day, with the names of the Members in brass on their locker. Membership was now limited to 100 with a joining fee of £5-0-0 and an annual subscription of £1-0-0. 1880 The New Clubhouse opens on 1st July 1880. 1881 Tom Dunn returns from Wimbledon to become Head Greenkeeper. The Cree Medal for juniors is played for the first time. 1883 There are 143 Members of The New North Berwick Golf Club. Teeing grounds on 4 holes extended. 1888 A new lease agreement between Miss Nisbet Hamilton of Biel, The North Berwick Golf Club and The New North Berwick Golf Club is agreed. The first meeting of The Joint Greens Committee is held with representatives of all the Clubs who played golf over the West Links in attendance. The Clubs were Bass Rock Golf Club, The North Berwick Golf Club, The New North Berwick Golf Club and Tantallon Golf Club. The North Berwick Ladies Golf Club is formed with 37 Members, but they have no playing rights over the West Links. 1889 The North Berwick Ladies Golf Club soon has just short of 100 Members. The legendary Harry Vardon and Will Park Junior play a 36 hole Challenge Match for £100-0-0 over the course, with a further 36 played at Ganton Golf Club. It is estimated that between 7,000 to 10,000 spectators follow the match. 1890 Club finances show a balance of £70-0-8. The New North Berwick Golf Club now has reached its ceiling of 200 Members and the loan for the Clubhouse is decreasing. The New Clubhouse is extended by 2 rooms at a cost of £712-0-0. The North Berwick Ladies Golf Club now has 151 Members. 1893 The North Berwick Ladies Golf Club reaches an agreement to play Sanghs Field – now the Children’s Course. 1894 The New North Berwick Golf Club take over the lease for Sanghs Field. 1895 The new course now measures 6,095 yards in length. The Gold Challenge Medal is played for to celebrate the extending of the course. This medal is still played for each year and is on display in the New Clubhouse. Quotes to extend the New Clubhouse to a 2 storey building are sought. The cost is £2140-0-0. Tantallon Golf Club offer to buy the New Clubhouse for £2500-0-0 as The New North Berwick Golf Club look at 3 West Bay Road as a new venue. They offer £4500-0-0 for the house but the sale falls through. Tantallon Golf Club Membership is limited to 300 Members. Perfection (now the 14th hole on the course) is created. 1899 Future Prime Minister, Mr AJ Balfour becomes Captain of The North Berwick Golf Club. Caddies aged 14 and over are required to wear a red armband, if under 14 they wear a blue armband. 1900 Inchgarry House is put up for sale for £7000-0-0. Members of The New North Berwick Golf Club (?) vote 84 against 54 to buy the house and build a new Clubhouse in the gardens. They would then sell off the house with a reduced garden for £3200-0-0. The cost of the new Clubhouse would be £4245-0-0. The New Clubhouse would become a private residence valued at £1500-0-0. The deal fell through. 1902 A new 21 year lease is agreed at a rent of £450-0-0 per annum. 1905 The British Ladies Championship is played on the course. 1909 The bank balance is shown as £45-6-2! 1914 The Club’s fortunes have improved and show a balance of £2636-2-4. 1915 There are now 10 Greenkeepers now employed. 1916 The North Berwick Ladies Golf Club now has 159 Members and its own clubhouse in the grounds of The Marine Hotel. Their course rental is now £60-0-0. 1918 The New North Berwick Golf Club approaches The North Berwick Estate to lease the land between the March Dyke and ground leased by the estate to the Burgh. The rest of the course is included in the discussions which are concluded in 1922. The North Berwick Ladies Golf Club now have 150 Members and played their first ever meeting over the 18 hole course. The New North Berwick Golf Club buys a horse to help with course maintenance. 1920 The Club begins discussions with The Archerfield Estate to purchase land for £9000-0-0, plus the Ladies Course for £1400-0-0 and additional land for £2400-0-0. The Council steps in and blocks the sale and increases the rent to £700-0-0. 1921 The Town Council offer £10,750-0-0 for the land from the March Dyke, Ladies Course and foreshore. Talks stall. 1924 Discussions between The New North Berwick Golf Club and The North Berwick Ladies Golf Club about a merger take place but are inconclusive. The New North Berwick Golf Club takes over the maintenance of the Ladies Course (now the Children’s Course). 1925 Club purchases its first tractor. 1927 A second tractor is purchased and the cost of maintaining the course rises to £3383-0-0. Green Fees raised from 4 shillings to 5 shillings. 45 acres of land leased from Colonel Grant to house the current 9th and 10th holes. 1932 On 1st August the centenary of The North Berwick Golf Club is celebrated in The New North Berwick Golf Club Clubhouse (the New Clubhouse). 1933 Discussions take place between The North Berwick Ladies Golf Club and Tantallon Golf Club, but fail to progress due to the stringent conditions requested by Tantallon Golf Club. 1934 The New North Berwick Golf Club and The North Berwick Ladies Golf Club enter into discussions about a merger, but again nothing is agreed. 1935 The New North Berwick Golf Club, The North Berwick Ladies Golf Club and Tantallon Golf Club enter into discussions about a merger, and again nothing is agreed.Members of The North Berwick Ladies Golf Club become Associate Members of The New North Berwick Golf Club. 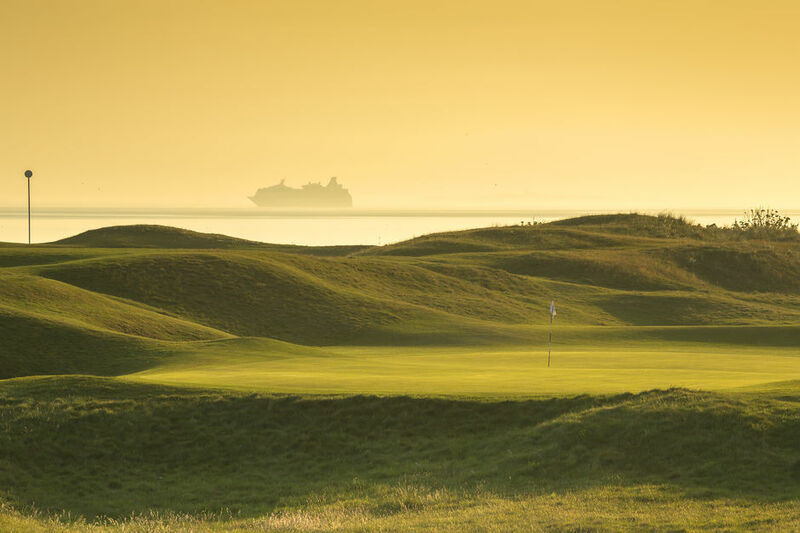 The inaugural Scottish Boys Championship is organised and hosted by The New North Berwick Golf Club and is competed for over the West Links until 1968. 1943 The 9th and 10th holes are requisitioned by the Air Ministry for an armaments range. The holes are badly shot up! 1946 Records show 103 Members of The North Berwick Golf Club with 57 Members of The North Berwick Ladies Golf Club. Play in 4 balls is still not permitted on the course. 1949 The land to the west of March Dyke (wall on the 3rd hole) is put up for sale for £10,000-0-0 by Biel Estates. 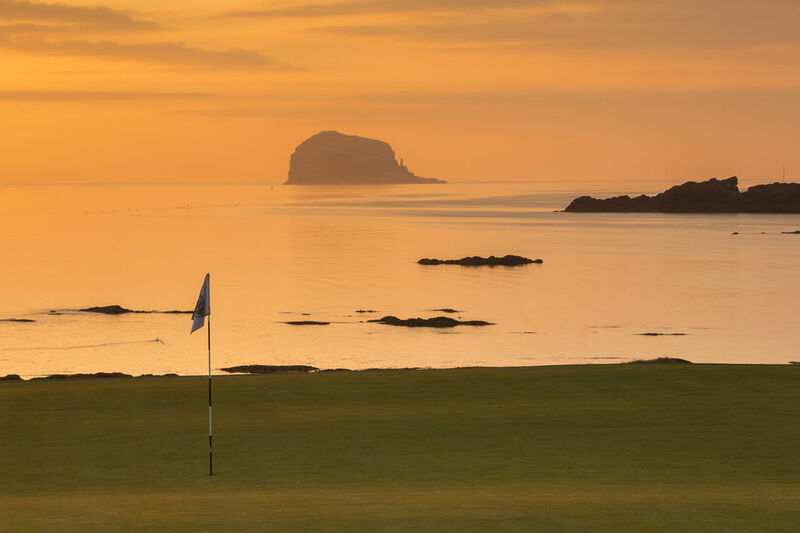 The New North Berwick golf Club offers £9,000-0-0 and the sale falls through, although the Club are given first refusal should the sale of the land be reconsidered. 1953 The same land is put up for sale for £10,000-0-0 by Biel Estates. The New North Berwick Golf Club offers £7,000-0-0 with a further £500-0-0 on the advice of their valuer. The Town Council also offer to buy the land but not in competition with the Club, who agree to “….march with the Council….” to purchase the land. The owners propose a £7000-0-0 with a £3000-0-0 bond, which the Club refuses. Westerdunes Hotel makes a bid, matching the valuation by Biel Estates and presses for a decision. They plan to start the course near the hotel (the current 8th tee) and turn at March Dyke, with further holes developed to the west of the current 9th hole. 1954 The Town Council steps in and buys the land for £9,700-0-0 and grants The New North Berwick Golf Club the lease for 15 years at £450-0-0 rental per annum. 1955 Golf on a Sunday has never been permitted and discussions take place to allow this to happen. 1957 Sunday golf is permitted for the first time on the course. Sir Hew Dalrymple hands over the land to the East of March Dyke (the land the current 1st, 2nd 3rd, 16th, 17th and 18th holes are on) to the Burgh. 1960 The North Berwick Golf Club uses a marquee for the final time to hold its annual meeting, having done so for 128 years. 1962 The North Berwick Golf Club makes a formal offer to The New North Berwick Golf Club to merge. 1963 On 1st January the two Clubs finally merger to become The North Berwick Golf Club based in the New Clubhouse. 1967 David Huish is appointed Head Professional. 1975 David Huish leads The Open Championship at Carnoustie after 2 rounds. 1983 Once again a merger between The North Berwick Golf Club and Tantallon Golf Club is discussed, but fails to materialise. 1988 The Marine Hotel makes a move to obtain the lease for the course and offer to build a clubhouse and spa for members. 1992 The Steward’s flat on the first floor is converted into the East and West Lounges. The Club hosts Final Qualifying for The Open Championship for the 4th time. 1996 The lease for the course is awarded to The North Berwick Golf Club for 99 years. 2000 The Millennium is marked with the building of the Starter’s Lodge. 2004 Proposals made for a significant development of the New Clubhouse that examines the future relationship with both The North Berwick Ladies Golf Club and Tantallon Golf Club in what is known as The Sayers Project. 2005 Members of The North Berwick Ladies Golf Club vote to become Full Members of The North Berwick Golf Club. 2007 The Club celebrates its 175th Anniversary in a marquee specially erected behind the 18th green for the celebrations and as originally done by the Club at its first meeting. The Club hosts Final Qualifying for The Seniors Open Championship. The development of the New Clubhouse commences although on a smaller scale than proposed in The Sayers Project. The temporary Clubhouse is a suite of portakabins located to the east of the Clubhouse. The Club hosts The Ladies British Open Amateur Championship. The New Clubhouse development is completed and opens to the Members on 1st December. 2009 David Huish retires after 42 years’ service as Head Professional. His son, Martyn, takes over as Head Professional.Catriona Matthew, one of our Honour Life Members, wins The RICOH Women’s British Open Championship at Royal Lytham & St Annes GC to secure her first major. 2010 The Club co-hosts The Amateur Championship with Muirfield. 2014 The Club hosts The Seniors Home Internationals - won by Scotland! 2015 The Club hosts Final Qualifying for The Aberdeen Asset Management Scottish Open Championship. 2019 The Club is to host The Seniors' Amateur Championship.